I think my Peyote Bobbles series is a great example of how an idea develops and evolves over time. 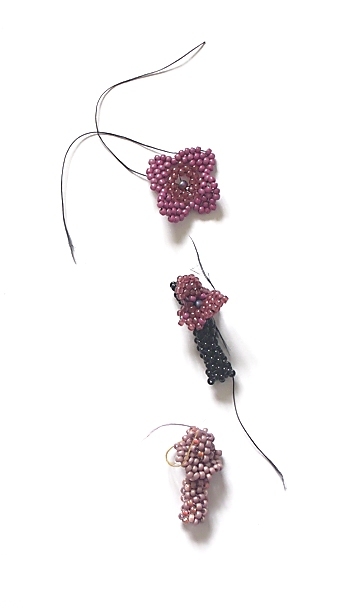 As you follow how it progresses remember that it all started from wanting to bead a flower! As I beaded the flower on the side of the rope I'd had the thought ‘why can't the flower form around the circumference of the rope?' this sample was my first experiment with this. I decided to change the beads I was using to see if this changed how I looked at it. However, I wasn't entirely happy with this sample. The flower was only one bead deep and seemed out of proportion with the rope. It was also only made up of one size of beads which wasn't working for me visually any more. I needed somehow to make the flower bolder and had already started having ideas about it not necessarily being a flower any more..
You can see where these thoughts led with my fourth sample.